The university community is invited to attend the Grand Opening of WALS (Western Active Learning Space), Western’s newest learner-centred, activity-based classroom. 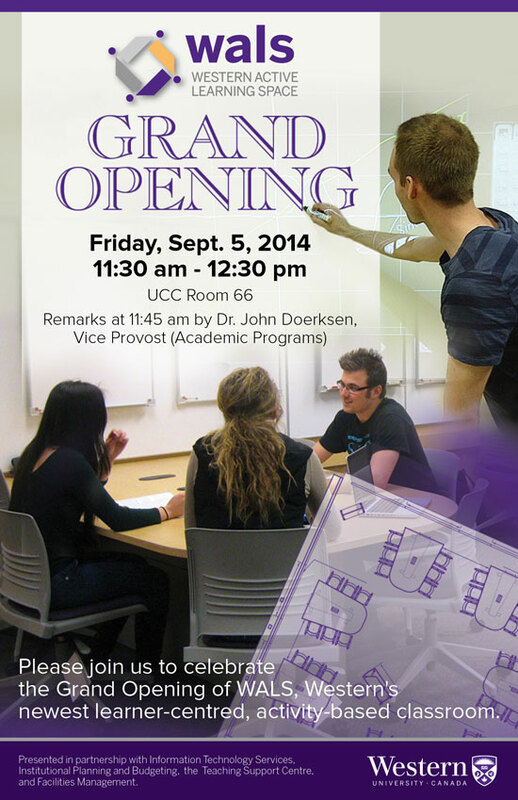 Please join us on September 5, 2014 from 11:30 am-12:30 pm in UCC 66 to experience the new space, explore the technology, and observe student demonstrations. Bring your own device (laptop, tablet, smartphone) and “plug in” to discover the potential of this new teaching and learning space. Dr. John Doerksen, Vice Provost (Academic Programs), will bring remarks at 11:45 am.